Dinner has always been important in my life —as a child, a chef, and especially now as a dad. It’s the remains of the day whether I’m home or at work. The difference is dinner at home is a time to relax and reflect, while at work it’s a time to hustle. In a week of family dinners, Sunday Supper is queen. Yes growing up, we called it supper, for some reason, and got to eat in the dining room! My mom would usually make a roast with crispy lemon rosemary potatoes and green beans —her signature. For your Sunday Supper, the trick is to make simple things that seem fancy. Fancy because it’s the occasion, and simple so you can still watch the game or play outside with the kids. Here’s a recipe for one of my signatures —Pork Tenderloin with Apricot Sauce. Of course, I recommend serving it with green beans. Preheat the oven to 400 degrees F. Season the tenderloins with salt, pepper and rub with half the oil. Heat the remaining olive oil in a large heavy frying pan, add the tenderloins and brown until crispy on all sides. Place the pan in the oven and roast for about 15 minutes, or until the meat reaches 150 degrees F.
When the pork is cooked, remove it from the oven and place on a cutting board. Add the jam, water, garlic and optional wine to the pan with the pork juices. Cook just until it boils, then turn off the heat. 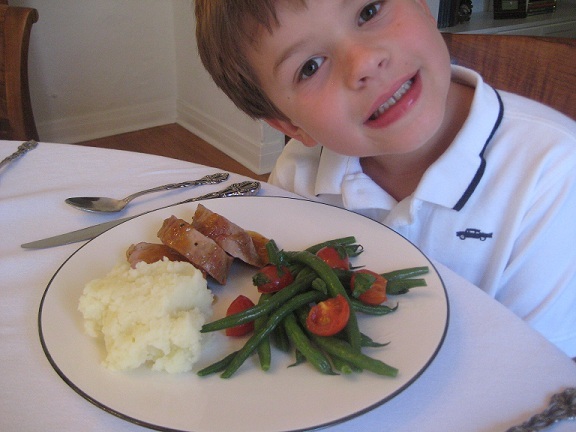 Slice the pork into 1-inch-thick slices and serve on your best china with buttered green beans and mashed potatoes. Spoon a little sauce over the meat. Take the meat out of the fridge, season it and let it sit for 20 to 30 minutes at room temperature so it will cook faster and more evenly. Heat the pan, then heat the oil, and then add the meat so it won’t stick to the pan. It’s okay for pork to be pink when it’s cooked. Cook the green beans anytime during the day, rinse them with water to cool, then heat them up with a little olive oil at the last minute. Add a few cherry tomatoes when you’re heating the beans for color and flavor! Family dinners are the glue that holds us together. It’s a tradition Marilyn and I learned from our parents, and one we expect to carry on until Ben and Nick have families of their own, which is the day we’ll be guests in their homes. I am looking forward to Sunday Supper already! !